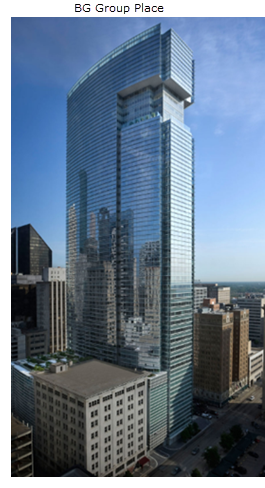 ​​HOUSTON – The Thompson & Knight law firm has leased 70,000 sf of sublease space in the BG Group Place building at 811 Main in downtown Houston. The law firm is relocating from the Three Allen Center, 333 Clay St. in downtown. BG Group is vacating the building (also known as 811 Main),​ which was developed by Hines. The 46-story, 974,000-sf tower is located on the block bordered by Fannin, Rusk, Main and Walker St.
BG Group Place is a LEED Platinum certified Class A office building clad in horizontal sunshades of glass and aluminum that wrap around the building’s curved north and south façades.